What about 'Faith According to Apple' ?! Just a fun session, using Apple products to get us thinking about our faith in Jesus and our Christian lives! 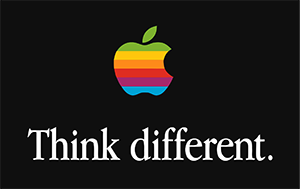 Back in the day, one of Apple's straplines was 'think different'. And this is something we should do as Christians. This is what the Bible says... It encourages us to be different, not to copy the stuff other people do but instead to let God change us from the inside out to be more like Him - it's the best way to live life! Romans 12.1-2 - And so, dear brothers and sisters, I plead with you to give your bodies to God because of all he has done for you. Let them be a living and holy sacrifice—the kind he will find acceptable. This is truly the way to worship him. Don’t copy the behaviour and customs of this world, but let God transform you into a new person by changing the way you think. Then you will learn to know God’s will for you, which is good and pleasing and perfect. Hebrews 13.14 - For this world is not our permanent home; we are looking forward to a home yet to come. So what we can learn from the 'Airport Utility'..? This is what helps the computer set up and discover WiFi signals and then control them. What is WiFi? Basically, we know that it is the internet signal broadcast over the airwaves and received by devices that are tuned in to receive the signal. So here's a question for you... How do you spend your time? What kinds of signals do you allow into your mind and your eyes? What kinds of things do you watch on TV, listen to - or view on the internet?Are they the kinds of things that Jesus would listen to? Or here's another question - what do you think about yourself? Do you think what God thinks or do you allow yourself to think bad thoughts about yourself? God says you are precious, valuable, unique, accepted by Him, beautiful, hand-crafted, woven together, amazing, and that you are fully loved by a perfect Father (God). Sometimes we have to make a real effort not to tune into the signals around us that aren't from God. We have to tune into good things, God-stuff and know and believe that what God says is true. The light is brighter than the darkness and the light is Jesus! Here's what Jesus said in Matthew 6.22-23 - “Your eye is a lamp that provides light for your body. When your eye is good, your whole body is filled with light. But when your eye is bad, your whole body is filled with darkness. And if the light you think you have is actually darkness, how deep that darkness is!" The App Store is the way that the Apple computer gets most of its updates and upgrades. This may be the Operating System or it may be programmes on the computer. Here is what happens when you become a Christian. Things change! The old 'operating system' that you had is deleted and a new 'operating system' gets installed on the inside of you! It's amazing but this is exactly what God does in your spirit (the spiritual part of you). God takes away the old and he replaces it with the new - he calls this the 'new birth' and it's like having a massive new operating system installed. Except this one isn't filled with code, it's filled with the Holy Spirit. 2 Corinthians 5.17 - This means that anyone who belongs to Christ has become a new person. The old life is gone; a new life has begun! But while the operating system is new inside of our spirits, God also has to apply lots of upgrades in our lives to protect us from viruses and to help us keep living right. So just as the App Store searches for upgrades and updates, so God is always working on the inside of us to keep us updated and fresh. But we do have to do our part - we have to say yes to God and he will help us... just as we have to click to install some software. Other times, God helps us without knowing - just as if it's an automatic update. But God's updates never fail and never crash and they are often unique to us - he is the perfect engineer and knows exactly what we each need! One of the incredible things about God is that he chooses to relate to us, to use us and help us. He created us because he wanted to. He loves us because he does - not because we are always lovable! But he really loves us and loves to spend time with us. He wants to speak to you, to hang out with you and enjoys you too. He is like a proud father and it must make him happy when we want to spend time with him. Spending time with God is really important because he will speak to us and we can speak to him, telling him everything that concerns us, asking him for what we need and asking God to help other people. This is called prayer - our prayers are really our 'Face Time' with God. Our prayers are amazingly powerful and God answers prayers that fit in with his ways and his word (The Bible). We can ask God for anything in line with his will and know that he hears us - and he will answer us. God is always 'online' and always ready to hear from us. He's never too busy and loves it when we speak with him. So just walk along and do life while you speak to God about everything around you. And also spend special times praying too. When we do this, we will see God's will be done and see his ways happen around us! Exodus 33.11 - Inside the Tent of Meeting, the Lord would speak to Moses face to face, as one speaks to a friend. Afterward Moses would return to the camp, but the young man who assisted him, Joshua son of Nun, would remain behind in the Tent of Meeting. 1 John 5.14-15 - And we are confident that he hears us whenever we ask for anything that pleases him. And since we know he hears us when we make our requests, we also know that he will give us what we ask for. You see, God is the one who deserves to be worshipped - and no-one else. He is the one who created us and who created the world. When we worship anything that isn't God, we're worshipping something that has been created. When we worship God, we worship the Creator! There are loads of amazing things that happen when we spend time in worship with God. We get to think and sing to music about God, it helps us remember the Bible, it can really speak to us when we feel down and God also says that he is right there in the middle of our worship. Worship can change the atmosphere, help us to hear God's voice (it's often the time when God speaks), fill our hearts and minds with good thoughts and I've seen people get physical and emotional healing in worship! All this is good stuff! Psalm 16.11 - You will show me the way of life, granting me the joy of your presence and the pleasures of living with you forever. Have you ever been lost? Have you been in the car with a parent or youth worker, or someone who looks after you - and they take a wrong turn?! Do you have a SatNav in your car or on your phone? One time, myself and a friend were driving from near Newcastle across the Yorkshire Dales back to the Lake District and we missed our turning off as we were busy chatting. We used the SatNav and ended up down some small random roads which was fun! I have seen drivers get stuck because they used a SatNav instead of their common sense! But what about life? Has someone done a 'Life Maps App' ? Well, yes. God was there first of all with the original Maps App. We call it the Bible and it tells us about God, about life, helps us make decisions, do the right things and is the main way that God will speak to us. It never sends us down the wrong road, it doesn't go out of date and is completely accurate. So the encouragement to you is to read the Bible. Try and create a habit of reading the Bible (maybe first thing in the morning or last thing at night). When you read it, ask God to speak to you. Try to learn Bible verses (or learn worship songs with the Bible in them). And think about the Bible throughout the day. It will show you the way of life and will keep you on the best path that God has for your life. It will also protect you! What is Siri? Well, according to Wikipedia, "Siri is a part of Apple Inc.'s iOS, watchOS and tvOS operating systems. Siri is a computer program that works as an intelligent personal assistant and knowledge navigator. The feature uses a natural language user interface to answer questions, make recommendations, and perform actions by delegating requests to a set of Web services. The software, both in its original version and as an iOS feature, adapts to the user's individual language usage and individual searches (preferences) with continuing use, and returns results that are individualized." When we become a Christian, we say to God - "I need you in my life" and God then begins to live on the inside of us. It sounds freaky but it's not. We all have a deep place inside of us that makes us human and unique from animals. The Bible calls this our 'spirit'. When we ask God to take control of our life, the 'spirit' bit of us gets filled with God's Holy Spirit who is the one who helps us and changes us. The Holy Spirit is like the perfect Siri. There are questions that Siri can never answer. But there are no questions that God can't answer! He helps us with absolutely everything because God cares about everything going on in your life and in the world. The Holy Spirit is our personal helper who helps us in all things. He never leaves us, he never does anything that's bad for us, he's never wrong and he helps us become more like Jesus. John 14.26 - "But the Advocate, the Holy Spirit, whom the Father will send in my name, will teach you all things and will remind you of everything I have said to you." John 16.13 - "When the Spirit of truth comes, he will guide you into all truth. He will not speak on his own but will tell you what he has heard. He will tell you about the future." If you haven't asked God to be the one in charge of your life and want this, say these words to God now: "God, I want you to be in charge of my life. I'm sorry for the wrong things I've done and want to change, please forgive me. Come into my life and help me change to be more like you. Fill me with your Holy Spirit completely. Amen." If you are a Christian and really want the Holy Spirit to do a new thing in you and want to be filled up with Him (he is a person!) then pray this prayer: "Holy Spirit, I want the fullness of the Holy Spirit. I know you live in me but I want more. I want to be baptised and overflowing with the Holy Spirit. I ask you to fill me with all you have for me now and forever. Amen!"